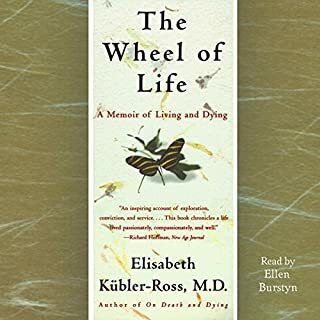 In The Wheel of Life, when Kübler-Ross was 71 years old and facing her own death, this world-renowned healer told the story of her extraordinary life. Having taught the world how to die well, she offered a lesson on how to live well. The Wheel of Life is an adventure of the heart - powerful, controversial, inspirational - a fitting legacy of a powerful life. Caring for the Dying describes a whole new way to approach death and dying. It explores how the dying and their families can bring deep meaning and great comfort to the care given at the end of a life. 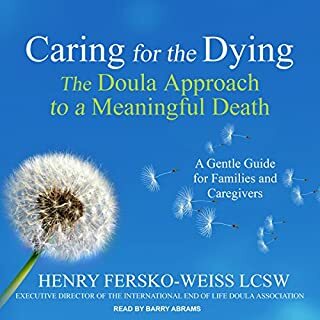 Created by Henry Fersko-Weiss, the end-of-life doula model is adapted from the work of birth doulas and helps the dying to find meaning in their life, express that meaning in powerful and beautiful legacies, and plan for the final days. Good; Narrator a little too "much"
Individuals approaching the end of life, and their loved ones, face many challenges - but as hospice nurse Karen Whitley Bell reassures us, this difficult time also offers an opportunity to explore and rediscover a richer meaning in life. Drawing on her years of experience, Bell has created a comprehensive, insightful guide to every aspect of hospice care and the final stages of life. For people in hospice care, as well as their friends and families, this is an indispensable reference, a trustworthy source of comfort and spiritual healing. The insight and wisdom of a hospice nurse. On Death and Dying examines the attitudes of the dying and the factors that contribute to society's anxiety over death. It closely looks at the five stages of death(denial and isolation, anger, bargaining, depression, and acceptance) and how the dying and living deal with them. In addition, this program offers multi-voice readings of some of the most revealing interviews Dr. Kubler-Ross conducted with her patients. By hearing some of the most intimate and sensitive feelings expressed by those men and women, it is hoped that we may learn more about death and lessen our own anxieties about the natural course of our lives. At its heart, On Death and Dying is a truly remarkable program about communication, offering insight on how to talk with and listen to the terminally ill, and truly hear their fears, hopes, angers, and anxieties. This audiobook is a splended primer for all people on the subject of death. It takes a kind and soothing look at the topic which most Americans are afraid to examine; our own mortality. The book is both an easy read or audio experience. It is written at a level which the common man will feel unafraid to encounter. I am a survivor of a Sucide some eight years now . My son attempted twice to complete suicide but we were able to save hi those times. He completed his Sucide 14 December 2002 at age seventeen. 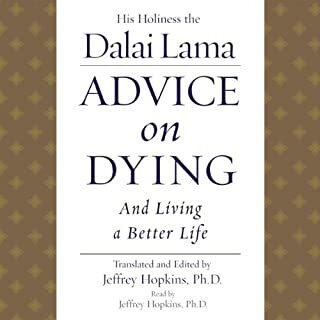 Every person above the age of reason should avail themselves of the wisdom in this book "On Death and Dying"gives humans You learn Dying is the last process of human life then comes death that carries us beyoun the vale. Although this is recap of a study done in the sixties I would hope that today these attitudes are the norm. Some of the insights were especially touching but, unfortunately we'll all have to experience death and its effects at some time or another. This book would be best utilized by those whose occupation would expose them to the terminally ill. Anyone who has experienced loss -- the death of a loved one, the loss of a job -- will benefit from this program. The program was a big help in dealing with the loss of my father. A wonderful production. Why the melancholic music and tone? Yes, I'm a psychologist and I recommend this (HIGHLY) both for clinicians and ANY PERSON who is trying to understand death, dying, and the temporary nature of our physical existence. The direct and candid discussion of a topic too many people avoid was refreshing and inspiring. Death is a reality but we don't have to be afraid of it. We just need to realize it and understand the role of death....in life. Would you be willing to try another one of Carol Bilger and cast ’s performances? No, I really did not like the melancholic and overly dramatic music and the overly empathetic tone of her voice. It reminded me of bad depictions of therapists in movies. Harps??? ...really, seriously?? ?...and that constant piano interlude designed to make the listener "feel" the mood. It was not necessary and actually that undermines the purpose of the book. The book is supposed to help people become realistic. Great book but if I can ever find another audio version with just the reading of the text without the pseudo emotion provoking music, I'll get that one instead. 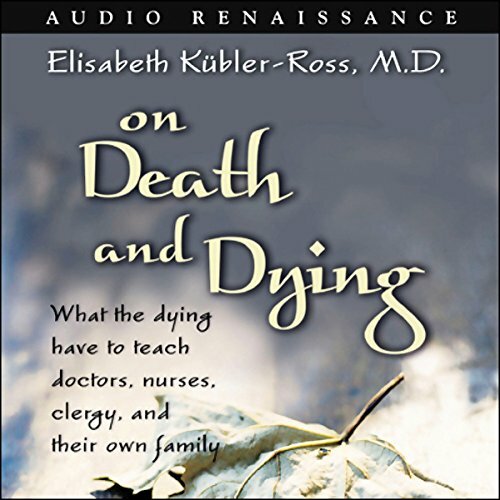 It was good to listen to this abridged recording of Elisabeth Kubler-Ross' classic "On Death and Dying." The book is written pastorally with the aim of sensitising and helping members of any of the helping professions to deal with people who face death. 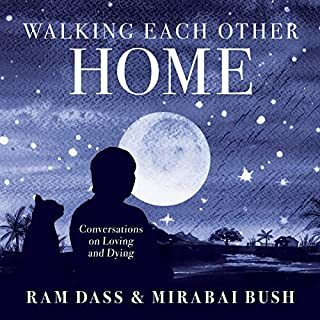 Kubler-Ross gives some very important perspectives on the whole matter and helps the listener to understand that dignity and self-worth are of utmost importance when dealing with someone facing death. Also don't beat around the bush. I found the book very valuable. While I know the stages of dying as well as grieving, this helped me place this knowledge into perspective. The book was superbly narrated by Carol Bilger and for the interview examples other voices was brought in to complement hers. This is a well-rounded production of a very important book - one which I highly recommend. Disappointing . . . ! What would have made On Death and Dying better? The first half of this book is informative and digs into the issues of end-of-life from the patient's, family's and sometimes the healthcare provider's view. I also appreciate the in-depth interviews in the second half of the book, this added a necessary narrative to difficult topics that a lot of people avoid discussing. However, I felt as if I was bamboozled because the second half read like a Christian radio programme! I appreciate the role of religion and fate at the end of life but I believe the choice of qualitative interviews went overboard to almost sway the reader/listener toward a specific religious belief. Again, disappointing! Has On Death and Dying turned you off from other books in this genre? If you could play editor, what scene or scenes would you have cut from On Death and Dying? Objective editing of the book! I had to surrender the attempt to listen to this book. The author is a professional doctor, discussing death and its impact, and how a study of it can inform other professional doctors. Death, the message is, should be confronted honestly. The book therefore seems to have been written in an approprietly sober tone. The various narrators, however, read it like it's bad love poetry, all soft and breathy, as if we, as listeners, couldn't handle the topic of death without the scent of roses in the air. That's irony, that is. I couldn't keep from gagging. Provides a great understanding of why we act the way we do! I am a Paramedic. Being in the field faced with death whether sudden or expected, is always a very hard subject to deal with! 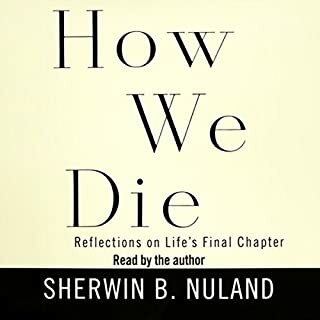 This book offers a very good understanding of why we act the way we do when faced with our own mortality. I recently loss my father who was on hospice care for about a month. This is the greatest loss I've ever felt. Although I can relate to some of the stories told in this book it was helpful to understand what my dad was experiencing/feeling at the time. The narrator's voice was comforting for such a sensitive subject. my 28 yr daughter recently passed.the pain is immense.Hearing of others struggles was comforting.Enlightening , Encouraging. Interesting personal stories throughout, the closing words are touching and poignant. Timeless. Has given me some fresh understanding. Where does On Death and Dying rank among all the audiobooks you’ve listened to so far? My first audio book however I read the book as part of a post grad course in 1982. 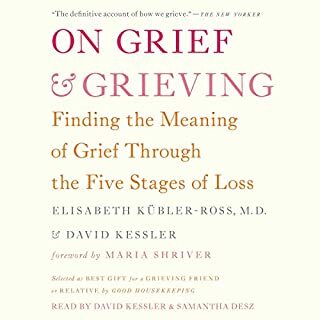 Kubler-Ross' work on the grief process was and is first class. I have purchased the book for my Father to assist him dealing with my Mother's dementia.